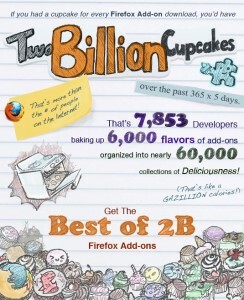 This morning, addons.mozilla.org reached a huge milestone: we served our 2 billionth Firefox Add-on download. This exciting feat was made possible by the huge community of people who have made and used Firefox Add-ons since we launched in 2005. When we reached 1 billion Firefox Add-on downloads in November 2008, we thought it would take us less than 3 years to get to the next billion, and with your help, we’ve gotten to 2 billion in half that time! With more than 150 million add-ons in use every day, we know that the next billion add-on downloads will be here before we know it. To celebrate this occasion, we asked you for your favorite add-ons and created a special collection we’re calling the Best of 2 Billion Firefox Add-ons. Check it out! We’re pretty sure you’ll find some add-ons that become an important part of making your journey on the Web easier, more productive or more fun. Let us know what you think of the collection and thank you for your part in helping us reach 2 billion Firefox add-on downloads! Firefox only? Or also Thunderbird, SeaMonkey, Sunbird, etc.? Wow. This is a tremendous milestone. Congratulations! I’ve accounted for a 1,000+ of those. The Best of 2 Billion isn’t too surprising, I just would like to have seen it expanded to say 50 (considering the total amount of available ones on AMO) and for it to include more add-ons by average joe developers rather than the corporate owned and developed ones even if some of those were started by average joes. Ones like Tab Mix Plus, MR Tech Toolkit, Web Developer, and others, and perhaps even some themes from some of the other loyal, dedicated, selfless, and consistent veteran developers (Ed Hume to name one). In any event, it’s awesome news and congrats. AMO has come a long way and has been greatly improved over the years. Thanks for the free toys and service! How many of those downloaded add-ons will still work with Firefox 4.0? How many even work with 3.6? It’s amazing how many of the plug-ins that are most important to me won’t work anymore for trivial or admin reasons. Not for tech reasons. I won’t upgrade my Thunderbird, for example, because the add on that let me edit the Subject line was arbitrarily obsoleted. Whether add-ons work or not is fully dependent on the developer of an add-on and them maintaining his or her add-on and keeping it up to date. It’s a pain to do so, especially for someone like me who isn’t technically knowledgeable enough to do it by myself (perhaps Jetpacks will change that) but, Firefox (or other Mozilla apps) will always change. Add-ons are additional, not hard wired (or coded) core functions of the browser so they have to keep up with the mother ship. Some add-on developers get tired of maintaining their add-ons and keeping up with the browser changes, and some simply have more important priorities so they abandon their add-on(s), or, are just slow getting to them to update them. As far as Firefox 4.0 compatibility, some developers are holding off because they are anticipating more changes to Firefox aside from the major ones they’re already facing.